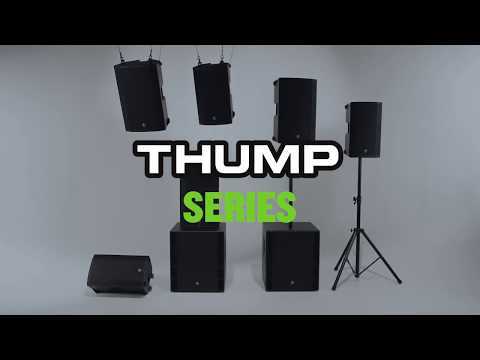 The Mackie Thump Boosted Series Thump15BST Active PA Loudspeaker inherits the outstanding performance of the Thump Series of speakers, and adds advanced features that make it something truly special. With the ability to: pair a Bluetooth enabled device to the speaker; wirelessly link a pair of speakers simultaneously; digitally control channel input levels with 3-band EQ via the Thump Connect app; and quickly adapt to different applications at the touch of a button, the Thump15BST is the stuff of dreams. The team at Mackie know a thing or two about building professional-grade gear that is durable, robust, and most of all, ensures that your audio is delivered in pristine fashion. The Thump15BST is equipped with a 15-inch high-output woofer that delivers a powerful 1000W of low-end energy, whilst the 1.4-inch titanium dome compression driver pumps out a healthy 300W high-frequency output thanks to the ultra-efficient Class-D amp. Mackie's next generation system protection prevents unwanted thermal overheating, and built-in active compression provides a line of defence for the drivers. The Thump15BST boasts a 3-channel digital mixer with a high-resolution full-colour screen that displays levels, metering, channel EQ, and so much more. A pair of digitally controlled Vita+ preamps with Wide-Z technology handle mic, line, and instrument signals dutifully, whilst the XLR-thru allows you to connect additional speakers with ease. As noted above, the Mackie Thump Boosted Series 15BST Active PA Speaker is lightweight with a 4-handle design that makes it easy to carry. The enclosure is built for heavy duty use, so you can be safe in the knowledge that it is well up to handling life on the road. The Thump Boosted speakers don't just benefit from pole- and tripod-mounts, but they even have hard-wearing fly points for permanent installation.